This is going to be a celebration for those who have embraced Flappy Bird, a game about a pixilated bird that overcomes obstacles that became controversial due to the decision of the creator to stop selling the game in app store along with its updates. Dong Nguyen, the Vietnamese creator of this popular game said that the Flappy Bird will Return Soon in Multiplayer Mode by August 2014. We can still remember that the game has been pulled from app store last February and it has been months already. Nguyen said that instead of spending too much time playing the said game and guiding the pixilated bird through the pipes, he would rather suggest that people should do something productive. At the peak of Flappy Bird’s success, Nguyen was earning $50,000 a day and the game has reached up to 50 million downloads. After the game has been pulled from the app store, Nguyen was still earning but not that much. Nguyen has other games to offer like a guy jumping from building to building and he introduced this so that the people could forget for a while Flappy Bird. Flappy Bird’s return comes with a multi-player version unlike the first one with only one player allowed to play the game. 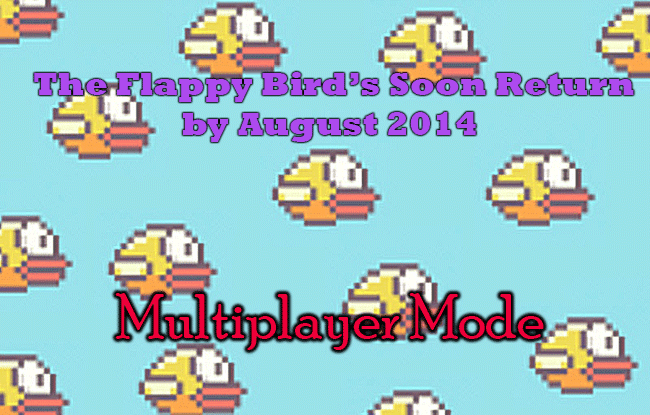 There is still no definite name for the game, it could be Flappy Bird, Flappy Bird 2 or Flappy Bird Multiplayer vesion. Let us see what changes will take place in the game this August. The one responsible for interviewing Dong Nguyen was CNBC’s Kelly Evans and through a Twitter tweet, the said information was made known to a lot of Flappy Bird fanatics out there. Will Nguyen leave Flappy Bird in the app store for good? Or he will decide again to pull out the product once it has reached its success? Anyways, Flappy Bird addicts, you have a reason to rejoice!